Named after owners’, Tim Perr and Scott Knight, coastal hometown of Pacific Palisades (Pali for short), located on the west side of Los Angeles, the wine bears the name of a Pacific Palisades neighborhood – Huntington. Probably better known for their wildly popular Meiomi Pinot Noir, Belle Glos makes a wonderful single vineyard Pinot from the Los Alturas Vineyard in the Santa Lucia appellation. Located in one of the highest-plantable sites in the Santa Lucia Highlands of Monterey County, this pristine bench offers the Las Alturas Vineyard cool, coastal days with consistent sunshine and a foundation of Gloria sandy loam soil. When planting this 15-acre vineyard, they matched various Pinot Noir clones to individual slopes and soil attributes of the land. Yields are deliberately kept low in order to preserve the fruit intensity these clonal choices provide. The Belle Glos Pinot Noir 2017, Los Alturas Vineyard starts off with a deep ruby red color and intriguing aromas of sun-warmed blackberries, ripe plums, with hints of black licorice. A complexity of dark berry fruits unfold on the palate; blackberries and bing cherries along with dark chocolate flavors. Vanilla and cedar oak undertones on the mid-palate further enhance the wine. The overall impression is rich with refined tannins, firm acidity and explosive layers of ripe fruit. Bill Stoller was born on the property and raised on the family farm outside of Dayton, Oregon. Bill’s decision to transform the family farm into a vineyard stemmed from much more than wishful thinking. With the help of Burgundian winemaker Patrice Rion and local vineyard consultants, Bill confirmed that the very factors that made this land a poor choice for turkey farming were perfect for an award-winning vineyard. In 1995, Bill planted 10 acres each of Pinot Noir and Chardonnay, combining the experience of consulting viticulturists with innovative vineyard techniques in order to maximize the grape’s quality. Crafted exclusively from estate fruit, the Stoller Dundee Hills Pinot Noir 2015 is made in an elegant, approachable style. It has aromas of brambleberry and cherry with floral notes of lilac and violets and understated hints of cola and cinnamon. The palate features a purity of red fruit flavors, bright acidity and medium tannins. This approachable wine pairs well with a variety of foods, including cedar plank grilled salmon with tarragon aioli, pulled pork with cherry chutney and pickled onions, creamed morel mushrooms with shallots and hard cheeses, especially Comté. 92 Points Wine Spectator. 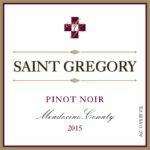 This is the 23rd release of the St. Gregory Mendocino Pinot Noir 2015, Mendocino County’s cool climate produces a very elegant and rich style of Pinot Noir with balanced acidity, dark color, full tannins and very fruity flavors. Their style is much more French Burgundy than California. 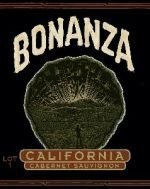 The grapes for this wine come from three truly unique vineyards located within three distinct appellations within Mendocino County. 79% of the blend is from Lost Creek Vineyards owned by Steve Petrucci and is located at the 1,200 foot elevation in the mountainous Yorkville Highlands appellation. 7% is from the Naughty Boy Vineyard located in the high elevation Potter Valley, which is grown next to the headwaters of the Russian River. 14% is Pinotage which is grown by the Gearhart Vineyard which is located in Knights Valley, just south of the Ukiah Valley in Mendocino County. 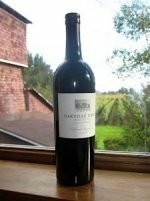 This wine is dark purple garnet in color and Burgundian in style; with rich, full and attractive aromas/flavors of ripe black cherries, plum, toasty oak and hints of earth. Soft tannins, balanced acidity and a rich, velvety mouth-feel produce a luscious wine that is enjoyable now and will develop more complexity with additional aging in the bottle. Delicious companions with this wine are duck with dried cherries, sage-roasted double pork chops with stuffing, and roasted lamb with Mediterranean vegetables.